By Keith Cowing on November 29, 2018 9:37 PM. Keith's note: I first published this exactly one year ago. Listening to all of the talk about going (back) to the Moon - and asking for a show of hands in the audience at NASA HQ for those who saw it live - I thought I'd give Jim Bridenstine something to think about. Keith's original 28 November 2017 note: There is a lot of talk these days about yet another pivot in America's civilian space policy. This time it is "back" to the Moon. Mars is not off the agenda - but it is not moving forward either. Personally I think we have unfinished business on the Moon and that creating a vibrant cis-lunar space infrastructure is the best way to enable humans to go to many places in the solar system - including Mars. Regardless of your stance on this issue, a common refrain about going back to the Moon - starting with President Obama is that "We've been there before". Humans first reached the South Pole by an overland route in 1911/1912. While we visited the pole by plane in the intervening years, no one traversed Antarctica's surface again until 1958. 46 years between Antarctic polar traverses. Why did we go back to do something - again - in a similar way - to a place "we've been [to] before" after 46 years? Because there was still something of interest there - something we'd only had a fleeting exposure to - and we had developed new ways to traverse polar environments. James Cameron revisited the Challenger Deep in 2012 - after a human absence of 52 years. Why? See above. It is understandable that explorers seek to explore new places and not redo what has been done before. There is only so much funding and there are still so many places yet to be explored. But it is also not uncommon for explorers to revisit old, previously visited locations with new tools - and new mindsets. Look at the stunning imagery Juno is sending back of Jupiter. Compare that to what we got from Galileo - and Voyager - and Pioneer. Why send yet another mission to the same destination unless, well, you have better tools - tools that enable the pursuit of ever greater exploration goals. I was 15 when humans first walked on the Moon. The generations who have followed mine have never seen humans land and walk on the Moon. Indeed a lot of them seem to think it never happened. But American space policy is made by Baby Boomers (and older) population cohorts so we just operate on our own biases i.e. been there, done that. Take a look at the chart below. 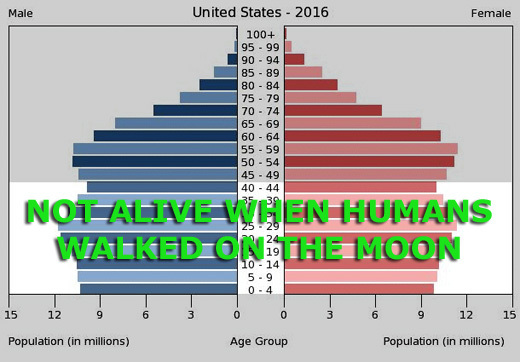 More than half of the Americans alive today never saw humans walk on the Moon - as it happened - including the person slated to become the next administrator of NASA and the entire 2013 and 2017 astronaut classes. If/when we go back to the Moon in the next 5-10 years this number will increase. For them these future Moon landings will be THEIR FIRST MOON LANDINGS. That's several hundred million Americans waiting to see what I saw in 1969. This page contains a single entry by Keith Cowing published on November 29, 2018 9:37 PM. That NASAWatch Guy was the previous entry in this blog. George H.W. Bush is the next entry in this blog.